Bob Raines–Digital First Media Abington’s Robbie Heath swats away a shot by Upper Dublin’s John Barrett but draws a foul as well Feb. 12, 2016. With his team down two and less than five seconds to go, Upper Dublin senior John Barrett nailed a corner three, giving the No. 27 Cardinals a 41-40 victory over No. 6 Abington to advance to the second round of the playoffs. Abington’s final possession ended with Robbie Heath driving the entire length of the court and having his shot blocked at the rim by Will Derr to seal the Cardinals’ victory. Offensively, Derr had 14 points on the night. Barrett finished as the games’ leading scorer with 18 points on seven field goals, including one very big three. Barrett was also the driving force on offense for UD in the first half, scoring nine points with four field goals and a 2-of-4 performance from the line. Eric Dixon proved to be a force inside for Abington, scoring 11 points to lead the Ghosts. The freshman had just one point in the second half, but Brian Close picked it up from there, as he scored eight of his 10 points in the final 16 minutes. Abington led from 2-0 through 40-38, with the game having just two ties along the way. The Ghost lead never grew to more than six on the night, however. Upper Dublin faces No. 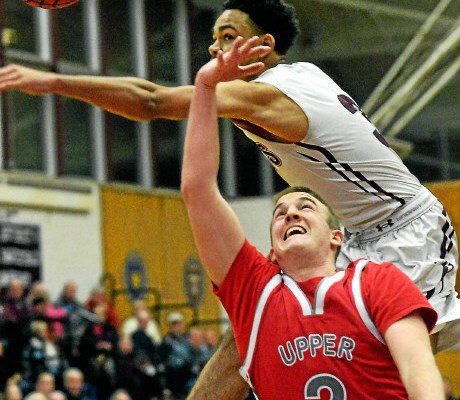 11 Lower Merion in the second round of the District-1 AAAA playoffs Tuesday.